“Sin Permiso” is a criticism of corrupt bureaucratic processes by bourgeoisie government delegates. The lyrics place vagabonds and rebels in opposition to government authorities. Marx’s lumpenproletariat (beggars, guerrilla armies, or gangs) are offered as contrasting examples to bureaucrats, government officials, soldiers, and police. The concept of lacking of permission, as the title of the song insinuates, comes into play with the taking back of power and re-leveling these types of binary relationships found in society. The overarching theme of “Sin Permiso” is about resisting authority, protest, and reclaiming balance between two ends of corrupt social cells. In Cuba, issues of class are removed from mainstream discussions of nationalism, and signaling out class or racial divisions is often viewed as unpatriotic. Where as in Puerto Rico, class issues are overlooked by the struggle for nationalism, defined as either statehood or independence. The screenplay for the music video aims to play with time, location, moving forward, and the concept of progress. One rapper is in Cuba, the other is in Puerto Rico, each moving towards a future destination which ironically takes them back to the beginning of the music video. Just as "Guasábara" was beginning to get attention in Havana, I began to talk with El Aldeano about doing a third collaborative song that would include Los Aldeanos. Back in Puerto Rico I had played Los Aldeanos’ music for emcee, songwriter Eddie Dee. Despite having failed to participate in the recording with Magia he became very enthusiastic about potentially recording on this new collaborative track. Their writing style, he commented was reminiscent of his own, and their ability to question authority was in line with his own productions such as “Censurarme” (Censor me) or “Señor Oficial” (Mr. Police Officer). In Cuba, the project of collaborations was gaining notoriety, and many rappers would have been delighted to participate in this project. According to many Cuban colleagues, my choice to include Los Aldeanos in the project was interpreted as a ‘risky’ one. First off they are not integral to the Cuban Agency for Rap, which in Cuba it would be assumed that such a high profile international collaboration would be limited to Agency artists. Second, their highly charged critical lyrics guaranteed polarized responses to the project within Cuba. Their recent widespread fan support over the last few years had created new difficulties for the Agency and other government institutions to negotiate their sponsorship with their popular support because of their lyrics critiquing many elements of the Castro Administration. This deemed Los Aldeanos as marginal and politically dangerous to work with. Luis Diaz from the Puerto Rican group Intifada had been in touch with me because he was traveling to Cuba and wanted some contacts amongst Cuban emcees. I was familiar with Intifada as one of the key hip-hop duos out of Puerto Rico. Luis’ lyrics are primarily about Puerto Rican and Latin American nationalism, self-determination and independence. Yallzee is the groups musical producer. I connected Luis with the Cuban Agency for Rap artists such as Obsesión and Anónimo Consejo. In 2006 Luis joined us for a day at the hip-hop symposiums in its second year. When he was in Cuba he did not have the chance to meet Los Aldeanos, but upon his return to Puerto Rico he became very enthusiastic about recording with them. We discussed the possibility of the collaboration for about six months and I facilitated a series of conference calls between Luis and El Aldeano to decide on the theme. Luis gave me Yallzee’s beat in Puerto Rico in April of 2007. I sent the beat to El Aldeano in Cuba via a friend at the University of Madrid who sent my package to Cuba. El Aldeano received the beat and both him and Bian wrote their portion of the lyrics. They waited for me to get to Havana to record in July. I wanted to keep as much of the raw underground sound Los Aldeanos manifest in their musical recordings consistent for this track. Since they usually recorded at Humbertico's Real 70 studios, it only seemed appropriate to get him involved. Humbertico has been a significant part of the hip-hop movement in Havana for years. To work with him on this track is an added bonus. Until this adventure, I had only heard stories about how “far” Papa Humbertico’s Real 70 home studio was located with respect to central Havana. On the day we set out to record at Humbertico’s I met up with Aldo on Infanta & Carlos III. We caught a car to Old Havana where we met up with Bian. The summer was hot and every bus that could take us out to Humbertico’s neighborhood of Guanabacoa was packed beyond capacity with beach goers to the Playas del Este. We hired a car near the railroad station in Old Havana that took us out to the nearest point on the thoroughfare, 3 kilometers out by foot from Real 70. As we passed Alamar heading further east Real 70 began to seem endlessly far. When the car pulled over I thought we had finally arrived, but we were not even close, this is when the three-kilometer walk began. Aldo and Bian took turns caring the backpack with my recording equipment and the video camera. Not a single car that could offer us a brief lift passed by on the walk up. By the time we were half way there the three of us had drank all the water we brought with us and the late morning sun was beating down, turning into midday sun over our heads reflecting the beads of sweat that rolled down our faces. I could only image – how many songs get written along the walk up to Real 70? Finally, in a faint mind state, just when the thought actually crossed my mind, ‘if we don’t get there soon…’ Aldo gasped out – we’re here.’ I looked up to see on my right hand side a small yellowish house with the #70 next to the front door. We were on Real Street in Barreras, also known as Real 70 Studios. Back in 2007 when Sin Permiso was recorded, Real 70 was still growing. Humbertico worked on a Hewlett Packard PC, running Windows XP – an industry standard in Havana. Today he has a condenser microphone however when we recorded “Sin Permiso” he only had a very simple hand held performance vocal mic. Real 70 is an independent underground recording studio with very basic equipment. He recorded Aldo and Bian’s vocals for “Sin Permiso” throughout the afternoon while I filmed them recording. He bounced all the vocal files and saved the project in three formats to make sure I would have compatibility due to software and hardware differences between Macintosh and PC from Cuba to the U.S. Forewarned that working with Los Aldeanos was ‘risky’ I labeled all the files “Pupy y Los Que Son Son vol 1-12” a popular Cuban salsa band. Immediately back in the homemade Emetrece Productions Studio in Minneapolis I began compressing vocals and cutting up the track to make a new mix based on the previous reference. Highlights were moved around, filler audio takes became main lines, drops from the end of the song were moved to the front, and middle highlights were moved to the chorus. During this phase I gave the song the working title of ‘Despierta America’ (Wake Up America). It wasn’t until just before recording with Luis Diaz from Intifada that I gave it the title “Sin Permiso.” I spliced the ending which said ‘Asi se penso, y asi se hizo, la verdad no se dice con permiso’ (as it was thought, so it was done, the truth is not said with permission), and threw it to the front as the intro of the song. Immediately without having to think twice about it I gave it the title ‘Sin Permiso.’ The lyrics of the chorus state ‘From our streets to the entire galaxy.’ This concept sparked the idea of making the introduction of the song sound like it is being tuned in from an intergalactic radio. I played the reference over the phone for Aldo and Bian, they were very satisfied with the results. “Sin Permiso” was ready for Puerto Rico. I sent Intifada the reference and Luis began writing. It took a series of trips to record Luis. The first recording was good and sufficed, but Luis was uncomfortable with his flow style. 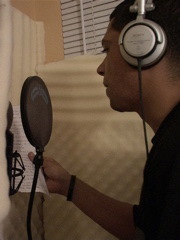 In Puerto Rico I recorded Luis in the underground vocal studio booth I had created called 009Once. We recorded three different sessions yielding seven versions of his verses in the song, in the mix I spliced the different portions of his vocals to form the final version with the best takes. 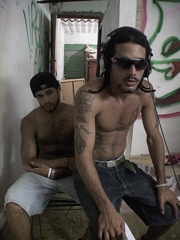 In June of 2008 we released the track “Sin Permiso” on Hip-Hop Vox in Puerto Rico. Both groups were represented with Luis and myself in the studio and El Aldeano on the phone participating in a one-hour long live conversation that was broadcast throughout Puerto Rico. Two months later, in August, Radio Ciudad de La Habana, broadcasting live throughout the entire Havana metro area, released the song nationally in Cuba featuring an on the air live interview with myself and Los Aldeanos. Así se pensó, y así se hizo. Cuba y Puerto Rico nos Unidos, es hip-hop underground Latino. Batalla, metralla, que la camarilla estalle. Hoy no se salva ni el soldado de rayas. Se lo espera verdadero hip-hop. Que escuchan por el contrario si luchan no hace ya la paz. Sociedad con falsa humanidad que excluye y no ampara los pobres. Es el olor de la política internacional. Gobernantes que disfrutan ser las prostitutas de la clase alta. Cuba y Puerto Rico línea recta. A plenitud, libre espíritu y tu? Que has de hacer? Tu fuerza en limite rebasa. Desde la esquina del barrio para toda la galaxia. Como un arpón atravesando la distancia desde nuestras calles para toda la galaxia. De Cubita la Bella pa’ la Isla del Encanto! Un triangulo, cinco franjas y una sola estrella de la Isla del Encanto pa’ Cubita La Bella. De ideas fuertes como roble. Que aquí se escupen frases en defensa de la clase pobre. Sacando a flote lo justo estamos a gusto. Rap con ética sin replica y mas fe que estética. Y ver la luna antes de que los yumas se pongan un par de pumas. Y que la ley con los de arriba también sea igual de cruel. Y que Posada fallezca este jueves. Y que se jodan los políticos. Ganando mas aplauso que el dinero un Paparazzi kamikaze en Londres. Y que las pandilla no se maten por drogas ni territorios. Y que el presidente de la UNO escuche esta canción. Que aplaude como idiota cuando un oficial le habla. Que reclama justicia pero no escucha su pueblo. Salario miserable y una sed hija de puta. Al estilo de Yallzee para los niños de Cuba. Y que se explote la panza de ese ilustre comelón. Recogiendo limosna, premiando su padrino. Libres somos como putas de la demanda y la oferta. Para que los federales hagan fiesta con mi casa. Con una peste a colonia pero es la patria que adoro. Porque matan con el AK los que jugaban Nintendo. Fieles a la causa y nos echan los tiburones. Entre barras y estrellas y se olvidaron de casa. Su carne de gallina como a perros de pelea. Debemos, recoger latas o robar líneas de cobre. Nos rompemos es lomo a beneficio de traidores.